Everybody might not love sausages, but everyone definitely loves the Melvins. 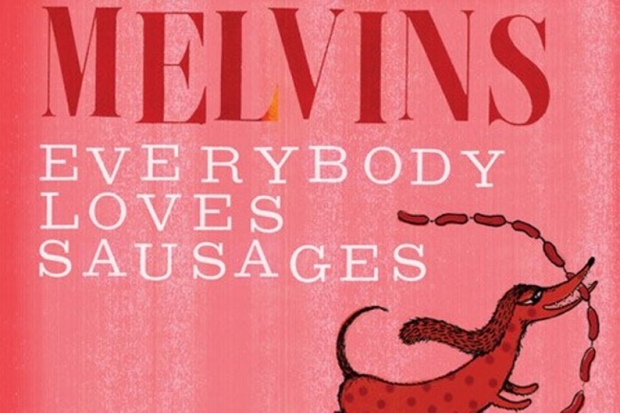 On Tuesday, the Melvins started streaming their new record online, Everybody Loves Sausages. From start to finish, the band brings it’s A-game to the album’s menagerie of metal, alt, pop and classic rock cover tracks. Sausages kicks off with a snarling homage to Venom, thanks to Scott Kelly of Neurosis on vocals, and the track “Warhead” from Venom’s 1984 album, At War With Satan. The record then continues on it’s noisy upward spiral with classic covers from Queen, an indulgent 11+ minute cover of Bowie’s “Station to Station” with J.G. Thirwell of Foetus on vocals, and 1979 Kinks track, “Attitude“. When it comes to Attitude, the Melvins simply own it. Much like Johnny Cash did when he covered the likes of Soundgarden and Nine Inch Nails. Other non-Melvin members appearing on Sausages include Mark Arm of Mudhoney, who supplied the vocals for “Set it on Fire” from Aussie band Scientists, and Jello Biafra on the track “In Every Dream Home a Heartache“, originally done by Roxy Music. Obscurity proves to be the Melvins’ friend when they take on early 80’s Sacramento band, Tales of Terror. The band only put out one self-titled record in 1984, but their crunchy, junkie business brand of raunch & roll lives on in future sounds from Green River and Nirvana. As we keep rolling along the obscure/bizarre musical train track with the Melvins, we arrive at the year 1974, and the bands cover of “Female Trouble” by Divine. According to Buzzo, John Waters has always been a huge influence for the band. Recorded on Christmas day in 2011, Buzzo sounds more like fellow weirdo Tom Waits than himself. Which only elevates the heavy darkness of the three-minute track. Sausages is a record as diverse as it is divey, loud and fuzzy. Also included in the online album stream is some great commentary by the king of metal and hair, King Buzzo himself. Listen and read along as Buzzo talks you the through each track over at Spin. The band’s 30th anniversary summer tour kicks off on July 12th in Phoenix. Yes, I know it’s a bit late for a Christmas post, but as big of a fan of ex-Screaming Trees vocalist Mark Lanegan as I am, I was completely unaware that Lanegan had put out a Christmas record last year. Since leaving the Screaming Trees, Lanegan has been prolific when it comes to expanding his catalog, both as a solo artist, as well as his various collaborations with artists like Queens of the Stone Age, Greg Dulli (Afghan Whigs), and Isobel Campbell (Belle and Sebastian). He’s also been tapped to provide the vocals on the highly anticipated Mad Season record, the recently reformed Seattle grunge super group formerly fronted by Layne Stayley of Alice In Chains. And, of all the great music that came out in 2012, Lanegan’s brilliant ‘Blues Funeral‘, was by far my favorite record. Unfortunately, Dark Mark is only available at Lanegan’s live shows. But you’re not quite ready to let go of your Christmas whiskey or spirit (like me), you can listen to all six tracks from ‘Dark Mark Does Christmas 2012’, here.